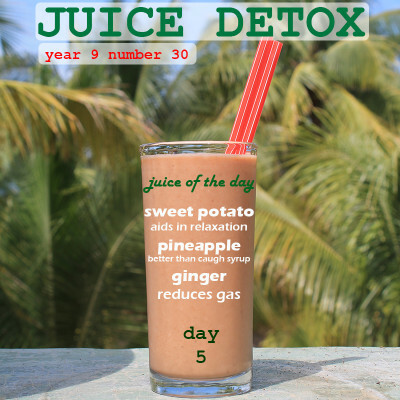 Home / Drink Recipes / Juice Detox / Recipes / Sweet Potato Juice? After you get over the initial confusion surrounding the idea of sweet potato juice, then you’ll want to know how many sweet potatoes it’s going to take to make a glass of this unusually delicious juice. You’ll definitely need a juicer for this one. Once I got past the Old South butter-fied way of sweet potatoes and after I got over my college infatuation with sweet potato fries, I was finally ready to juice. 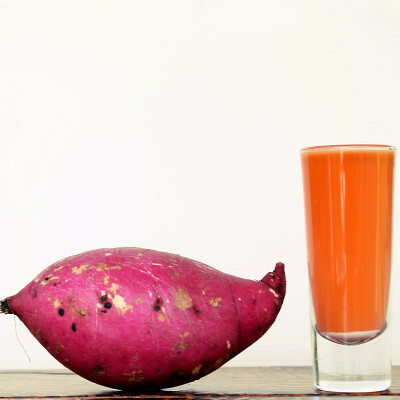 Like most fruits and veggies, juicing brings out the best and sweet potatoes are no exception. Sweet potatoes are a massive source of Vitamin A / beta-carotene, even higher than carrots! They are also high in vitamin C, B Vitamins, potassium, calcium and are even a rare low-fat source of vitamin E.
When choosing sweet potatoes the darker the better for nutrients. Rule of thumb is 1 sweet potato normally yields about a 1/3 of a cup of juice, and since the skins are pretty thick, I peel my potatoes before juicing. Juice-wise, sweet potatoes are most similar to carrots in texture and taste but can be a little starchy so its best to make a mix. The best bet is orange juice, which makes for an epic creamsicle-like drink. Want more? Download my free e-book full of superfood smoothie and juice recipes including the “Sweet Potato Pie” below.